Article by Alex Martin. Edited by Tom Hercock. Additional Research by Ellie Veryard. In 1776 Thomas Paine anonymously published Common Sense, a short pamphlet that argued that hereditary monarchical authority was absurd to the point of it being unjust. Published in Philadelphia its sales figures were unprecedented, heralded as the world’s first bestseller (excluding the Bible, the Torah and the Koran) it shifted the debate in intellectual circles from what ought the colonies do with their mother country, to a loud call for revolution and independence. Among other things the pamphlet coined the term ‘the United States of America’ and helped inspire Jefferson’s Declaration of independence. Later Paine penned The Rights of Man which was written in response to Edmund Burke’s conservative reaction to the French Revolution Reflections on the Revolution in France. Like Common Sense, The Rights of Man was full of cutting invective against hereditary monarchy: ‘The circumstances of the world are continually changing, and the opinions of man change also; and as government is for the living, and not for the dead, it is the living only that has any right in it.’ Paine also wrote pamphlets and polemics and histories on topics ranging from religion (The Age of Reason) to social welfare (Agrarian Justice) with phenomenal rhetorical and commercial success. 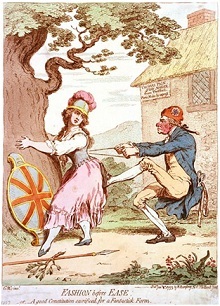 James Gillray’s 1793 caricature of Paine tightening Britannia’s corset with a tape measure labelled ‘The Rights of Man’ in his pocket. But why the hostility? 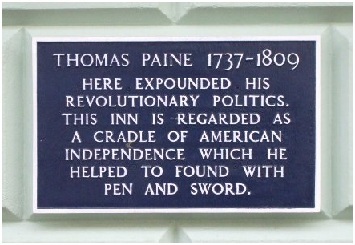 Perhaps Paine’s irreligiosity in The Age of Reason: ‘I do not believe in the creed professed by the Jewish church, by the Roman church, by the Greek church, by the Turkish church, by the Protestant church, nor by any church that I know of. My own mind is my own church,’ and The Rights of Man ‘my country is the world, and my religion is to do good.’ Or it could be his lack of nationalism, so rampant in revolutionary America, which can be seen in his willingness to participate in other revolutions and his quote from The Rights of Man that ‘my country is the world.’ However I think that there is a more satisfactory explanation for this. Paine argued for the abolition of hierarchies, including intellectual hierarchies. The likes of Adams used so called ‘higher learning’ like the classics, Aristotle, Plato, Socrates, Cicero etc to make their arguments. Paine appealed to the electorate’s reason and grasp of logic to get his arguments across, something that threatened the intellectual monopoly of the hypereducated. This marriage between the content of Paine’s work and the form. The logical consistency between the rhetorical arguments put forward by Paine and the consistent application of them in his own work and actions. The main argument in Common Sense is against monarchy, in particular hereditary monarchy; ‘the evil of monarchy … that of hereditary succession; and as the first is a degradation and lessening of ourselves, so the second, claimed as a matter of right, is an insult and imposition on posterity.’ As well as for a social order of based on the principles equality between men, ‘mankind being originally equals in the order of creation.’ Paine as a pamphleteer, fit for ‘a life of writing’, applies this principle to his own life and work, and writes to an audience of readers who are willing and able to participate in a democratic system. 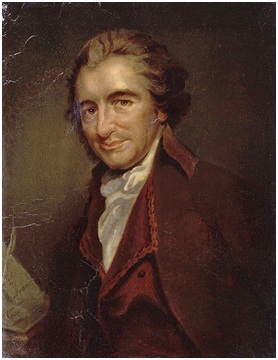 This is not mere ‘propaganda’ with all the dishonest connotations that stem from such an accusation, but persuasive genius growing from an sincere application of Paine’s own principles, and ought to be appreciated as such. Paine appealed to an authority that gave his argument legitimacy and force, but remained accessible to the people he was trying to enfranchise. Eric Foner wrote ‘Paine always tried to live as the exemplary republican,’ that’s not all; he wrote like one too. Only six people attended Paine’s funeral in 1809. James Chalmers, the author of opposition pamphlet Plain Truth (1776) regarded Paine as a political quack whose ideas would create a ‘degenerative democracy.’ The Revolutionary John Adams later called Common Sense “crapulous mass”. Abraham Lincoln allegedly wrote a defence of Paine’s deism in 1835 but the work was burned by a friend to save Lincoln’s political reputation.